This book for middle and upper elementary students tells one of the most famous stories in Japan about kamikaze pilots. One day two young pilots from Metabaru Airfield (Saga Prefecture), where they were training for kamikaze attacks, made an unscheduled visit to a nearby elementary school that had a Hupfer grand piano. One of them asked Utako Ueno , the teacher who had the key to the prized piano, whether she would open the piano so he could play it one last time prior to departing for his death. He played a beautiful rendition of Beethoven's Moonlight Sonata while his companion and Ms. Ueno listened. As the two pilots were leaving the school, another teacher gave them white lilies that she and her students had brought to school that day to decorate their classroom. Although the story of the two kamikaze pilots begins the book, the author focuses on Ms. Ueno as an ideal teacher. In high school she loved music and English, but she had to give up both of them during the war since the militaristic government prohibited the study of the enemy's language and considered music to be an unnecessary school subject. She soon become known as the "diary teacher" at Tosu Elementary School, where she encouraged her students to write down their ideas and experiences. The school's Hupfer grand piano from Germany made beautiful music, and Ms. Ueno had responsibility for the piano. She loved the piano so much that even during nighttime bombing raids during the war she would be near it with buckets of water to try to stop any fire from getting close. For many years after the war, Ms. Ueno kept the story of the school visit by the two kamikaze pilots hidden in her heart. However, one day in November 1989 she heard that Tosu Elementary School planned to get rid of the piano, which had been neglected over the years in a corner of the gymnasium. She rushed to the school to explain why it meant so much to her and asked school officials to preserve it. At a school assembly attended also by parents, she told the story of the two kamikaze pilots who came to visit before their final mission in order to play the piano one last time. A local newspaper article about the story generated many letters and phone calls to the Tosu Board of Education and to Tosu Elementary School from people who wanted the piano to be repaired so it could again make beautiful music. Ms. Ueno discovered that within Japan one other Hupfer grand piano existed in Kochi Prefecture. She contacted the owner Masaru Hamaguchi, a singer who dearly loved his piano, and he came to Tosu to visit. He knew an expert piano repairman, who restored the original sound to Tosu Elementary School's piano. After that, Ms. Ueno kept very busy for two years by visiting many places to tell the story of the piano and to talk about the preciousness of life and peace. However, probably due to overwork with a busy schedule of speeches, she passed away in February 1992. 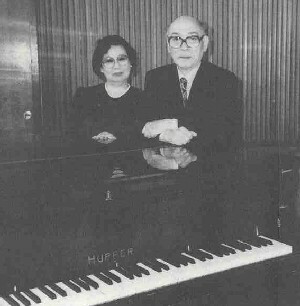 After Ms. Ueno's death, Tosu Elementary School lent its Hupfer grand piano for two years to the Chiran Peace Museum for Kamikaze Pilots, where it was displayed there in the front lobby. "The teacher's piano began singing in Chiran about the preciousness of life and peace" (p. 167). Some people who had known Ms. Ueno wanted this piano to remain at Chiran as a symbol of peace, but they could not extend the two-year loan agreement. They then decided to contact Mr. Hamaguchi, who agreed to donate the sister Hupfer piano to the Chiran Peace Museum, where even now it is displayed prominently in the lobby. In April 1995, Mr. Hamaguchi's piano once more began to sing the song of life and peace. This children's book has a good combination of pencil sketches and photos to visualize the story. Readers never learn details about the two kamikaze pilots, including their names, but the author probably intended this since the story's focus is Ms. Ueno. 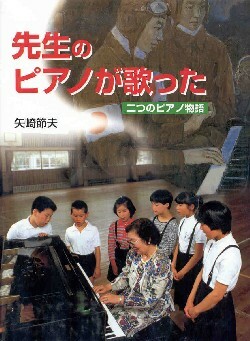 The author strongly stresses the theme of the preciousness of life and peace throughout the book, which was one of Ms. Ueno's firm beliefs that she emphasized to her students and to others when she gave talks about the piano in her retirement. 1. Her maiden name was actually Matsuda, but the author uses the name Ueno throughout the book.